Groundscape Solutions, A Fort Worth Landscaping and Installation Company, Designs and installs a Multi-tier Red Paver Retaining Wall. Pavers come in a variety of colors and make a great look for a retaining wall. Retaining walls are a great way to prevent soil erosion and a nice place to plant a flower bed. 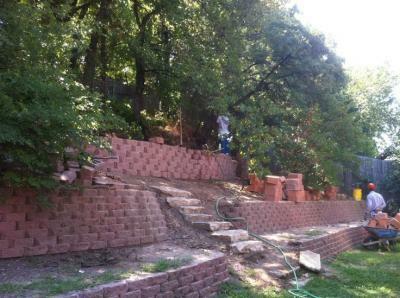 Retaining walls can be built in a variety of designs and can be built in multil-tiers. Give us a call at 817-759-0102 for a quote and more information and visit our website at www.groundscape.com Groundscape Solutions is a fully insured landscaping design and installation company and will provide references.